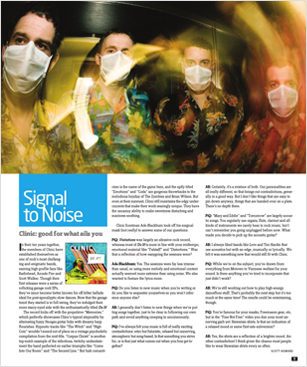 In their ten years together, the members of Clinic have established themselves as one of rock’s most challenging and enigmatic bands, earning high-profile fans like Radiohead, Arcade Fire and Scott Walker. Though their first releases were a series of rollicking garage rock EPs, they’ve since become better known for off-kilter ballads ideal for post-apocalyptic slow dances. Now that the garage trend they started is in full swing they’ve indulged their more starry-eyed side with the enthusiastically titled Do It! The record kicks off with the propulsive “Memories,” which perfectly showcases Clinic’s typical atypicality by alternating fuzzy Stooges guitar licks with dreamy harp flourishes. Hypnotic tracks like “The Witch” and “High Coin” wouldn’t sound out of place on a vintage psychedelic compilation from the mid-60’s. “Corpus Christi” is another top-notch example of the infectious, twitchy understatement the band perfected on earlier triumphs like “Come Into Our Room” and “The Second Line.” But lush romanticism is the name of the game here, and the aptly titled “Emotions” and “Coda” are gorgeous throwbacks to the melodious heyday of The Zombies and Brian Wilson. But even at their sunniest, Clinic still maintains the edgy undercurrents that make their work searingly unique. They have the uncanny ability to make sweetness disturbing and scariness soothing. PiQ: Visitations was largely an abrasive rock record whereas most of Do It! is more in line with your midtempo, emotional material like “Falstaff” and “Distortions.” Was that a reflection of how easygoing the sessions were? Ade Blackburn: Yes, the sessions were far less intense than usual, so using more melody and emotional content actually seemed more extreme than using noise. We also wanted to feature the lyrics more. PiQ: Do you listen to new music when you’re writing or do you like to sequester yourselves so you won’t reference anyone else? AB: I generally don't listen to new things when we're putting songs together, just to be clear in following our own path and avoid anything creeping in unconsciously. PiQ: I’ve always felt your music is full of really exciting contradictions: retro but futuristic, relaxed but unnerving, atmospheric but song-based. Is that something you strive for or is that just what comes out when you four get together? AB: Certainly it's a mixture of both. Our personalities are all really different, so that brings out contradictions, generally in a good way. But I don't like things that are easy to pin down anyway, that are handed over on a plate. There’s no depth there. PiQ: “Mary and Eddie” and “Tomorrow” are largely acoustic songs. You regularly use organs, flute, clarinet and all kinds of instruments we rarely hear in rock music but I can’t remember you going unplugged before now. What made you decide to pick up the acoustic guitar? AB: I always liked bands like Love and Tim Hardin that use acoustics but with an edge either musically or lyrically. So we felt it was something new that would still fit with Clinic. PiQ: While we’re on the subject, you’ve drawn from everything from Motown to Viennese waltzes for your sound. Is there anything you’ve tried to incorporate that just didn’t work? AB: We're still working out how to play high-energy dancefloor stuff. That’s probably the next step but it’s too much at the same time! The results could be entertaining, though. PiQ: You’re famous for your masks, Freemason gear, etc, but in the “Free Not Free” video you don your most unnerving garb yet: Hawaiian shirts. Is that an indication of a relaxed mood or some first-rate subversion? AB: Yes, the shirts are a reflection of a brighter mood. Another contradiction! I think given the chance most people like to wear Hawaiian shirts every so often.